A recent collaboration between the two groups allowed for the successful deployment of a re-engineered oceanographic buoy with additional Ocean Carbon System sensors. 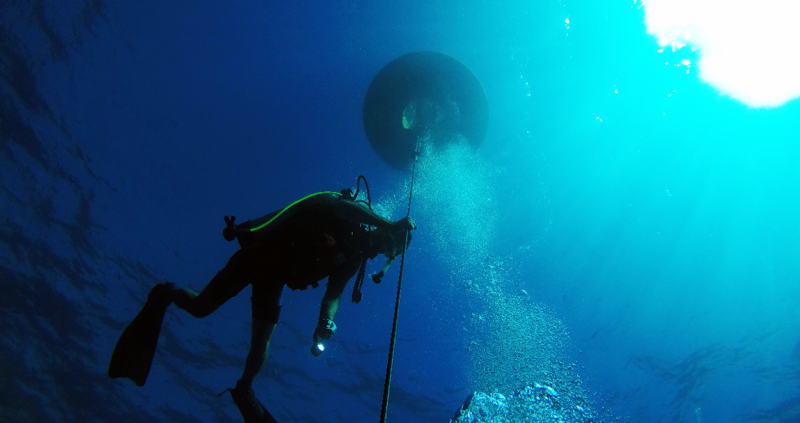 Chief Scientist, Jay Law, captures this photo as he examines the buoy and mooring line. ST. PETERSBURG, FL – To better understand the threats from climate change, scientists recently deployed a newly armed buoy that will help them monitor carbon—a critical piece of the climate change puzzle—along Florida’s west coast without leaving their offices and labs. As part of a joint initiative between the USF College of Marine Science (USFCMS) and the USGS St. Petersburg Coastal Science Center, the R/V Weatherbird II carried the newly-outfitted oceanographic buoy 70 nautical miles offshore of Tampa Bay during a 24-hour cruise in October as part of scheduled maintenance for the C12 mooring station. “Since the start of the collaboration [with the USGS], just four short months were needed to get real-time data,” said Jay Law, mooring technician for the USFCMS Ocean Circulation Lab (OCL) and chief scientist for the cruise. The project will help scientists get a better picture of changes driving ocean acidification, nutrification (eutrophication), and other coastal processes along the west Florida shelf. A number of groups at USFCMS made the project possible, allowing scientists at the USGS to expand their reach and hopefully gain a better understanding of coastal ocean processes, specifically the carbon system. The USFCMS Ocean Technology Group (COT) provided the expertise needed to bring the instrumentation together, including the code to integrate the new carbon system data, and the USFCMS Machine Shop fabricated custom parts to hold the new sensors. The OCL, headed by USFCMS Professor of Physical Oceanography Dr. Robert Weisberg, first developed the buoy program in 1993, with the first real-time buoy deployed in 1998. 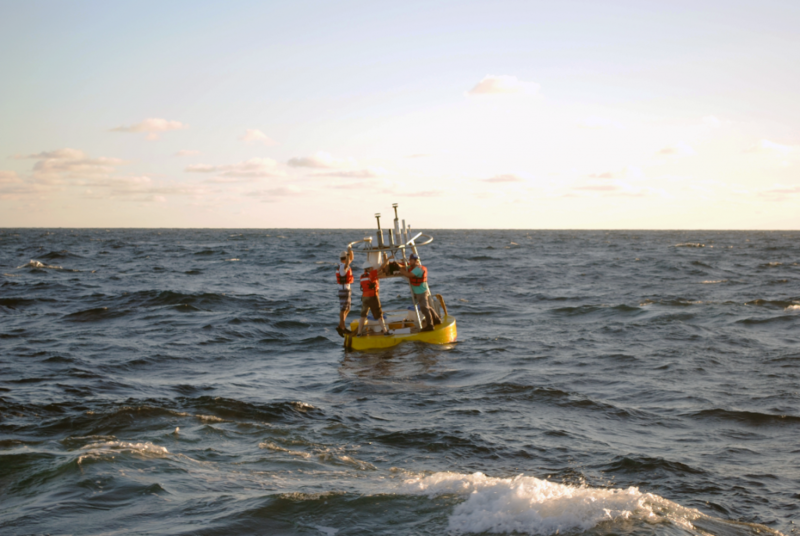 The buoys feed real-time data on wind, ocean currents, and water properties into models that are used to predict oceanographic events on the west Florida shelf (WFS), such as upwelling, red tides, storm surge and more. Dr. Kimberly Yates, research oceanographer at the USGS, and her group of scientists and technicians, benefit from the telemetry for real-time quality control—to know whether their sensors are losing accuracy or precision and need servicing. Accurate measurements of pH and pCO2 (the partial pressure of CO2 in water) require extreme care and, typically, highly sophisticated equipment. Upgrades to the C12 buoy, including a Pro-Oceanus CO2 sensor and Sea-Bird Scientific sensors for pH, dissolved oxygen, and photosynthetically available radiation, provide Yates with key carbon system measurements and allows for the calculation of other primary carbon system variables, like total alkalinity and dissolved inorganic carbon. With the primary variables known, she can also calculate the calcium carbonate saturation state of the seawater, a widely used indicator of the ability of calcifying organisms like oysters and mussels to construct their shells. The level of carbon dioxide (CO2) is changing in the ocean. The greatest addition of CO2 to the ocean results from atmospheric increases caused by the burning of fossil fuels, manufacturing of cement, and from land-use changes. At present, roughly one fourth of the CO2 added to the atmosphere is absorbed by the oceans, and taken together with other sources of CO2 increase, this makes the ocean more acidic. CO2 combines with water forming molecules of carbonic acid, which immediately dissociate, expelling hydrogen ions; pH is a measure of the negative log of hydrogen ion concentration, meaning that the pH of the ocean decreases (becomes more acidic). Shelled organisms are under increasing strain from this coastal and ocean acidification (OA). There are other processes that make the ocean more acidic along the coasts in particular. Run-off from urban and rural areas brings nutrients (mostly from fertilizers) to estuaries and coastal waters, which can increase C02 concentrations in a variety of ways. Direct increases occur, for example, from respiration by the organisms consuming the nutrients. Indirect processes include algal blooms, spurred on by the excess of nutrients, which cloud the surface waters and block light to seagrass – an ecosystem capable of substantially drawing down CO2. Upwelling, which brings nutrients from the deeper sea up to the surface ocean and into coastal shelf waters, varies seasonally and from year to year and can therefore add to coastal eutrophication when prolonged upwelling occurs. Side note: Nutrients transported to the surface in the open ocean typically act to combat the effects of OA by enabling the growth of phytoplankton, which draw down CO2 through the process of photosynthesis. In coastal regions however, excessive nutrient load is “too much of a good thing” and leads to algal blooms, etc. Members of USFCMS and USGS secure accessory parts for the suite of chemical sensors. The USFCMS-USGS collaboration aims to understand how these changes are impacting our estuaries and coastal waters. The C12 buoy lies roughly in the center of the continental shelf. With wind effects dominating the nearshore, and loop current and deep ocean effects dominating the offshore, the middle becomes a combination of the two. The oceanographic characteristics of the mid-shelf depend on changes in both the nearshore and offshore, hence the strategic location of C12. For the USGS, the addition of a mid-shelf sampling location, when paired with a network of sampling stations in Tampa Bay, provides data that will shed light on the connectivity between the deep ocean, shelf and estuaries. While the oceanographic applications of a multi-sensor buoy and telemetry system are numerous and complex, one simple lesson learned is that collaborations are invaluable, Law said. The team effort that brought this project to fruition has been remarkable. In four months, they went from having an unassembled product to a fully operational stationed buoy, transmitting data in real time. Moving forward, there is a lot of positive energy regarding the collaboration and anticipation for useful applications of the data transmitted by the buoy. The USGS work is part of an ongoing project funded by the Tampa Bay Estuary Program, the Environmental Protection Agency Region 4 (Southeast U.S.), and the Tampa Bay Environmental Restoration Fund. A live link of the downloadable data from the OCS buoy will be posted to the web when all of the sensors have received final validation.